Community groups across Toronto are a great inspiration for showing what we can achieve by working together to create a Waste Free Toronto. On Wednesday, TEA's Waste Campaigner, Emily Alfred, spoke alongside leaders from community projects across Toronto that are showcasing what communities can do to reduce, repair, reuse and recycle! Two community based groups talked about reducing what we buy and giving people the skills and tools to build and repair! The Toronto Tool Library members get access to high quality tools to help them build and repair without owning tools. They're now piloting a site at a Toronto Public Library in Downsview, a great example of how community ideas can scale up across the city. The Repair Café Toronto holds monthly events to link fixers to those with things needing repair. People learn repair skills so they can keep using things they already own. They're celebrating their 2nd year in Toronto on May 23rd. The Furniture Bank spoke about their work to get perfectly good second hand furniture to people who need it, keeping 11,000 tonnes of furniture from landfill! As a social enterprise, they also provide jobs and training for those with employment barriers. And they are expanding to furniture repair. Get Reel is a new recycling venture that will provide good employment for those facing barriers, but also recycle the iconic and difficult-to-recycle VHS tape. This for-profit venture is another example of how the 3R's are good for the economy! Let's get to zero waste, Toronto! These examples are not just one-off community projects, but evidence of the power of ideas, and the excitement and possibility in our own communities. As the City asks us to think about what kind of waste future we want, let's keep these projects in mind. Getting to zero waste isn't easy. But, with creativity and effort, we can find real solutions that build community, support a green economy and are good for the environment. We know it’s possible – other cities are doing it. Share your vision of Toronto's waste future: fill out the City’s Long Term Waste Strategy Survey. Take TEA’s Waste Free Challenge! 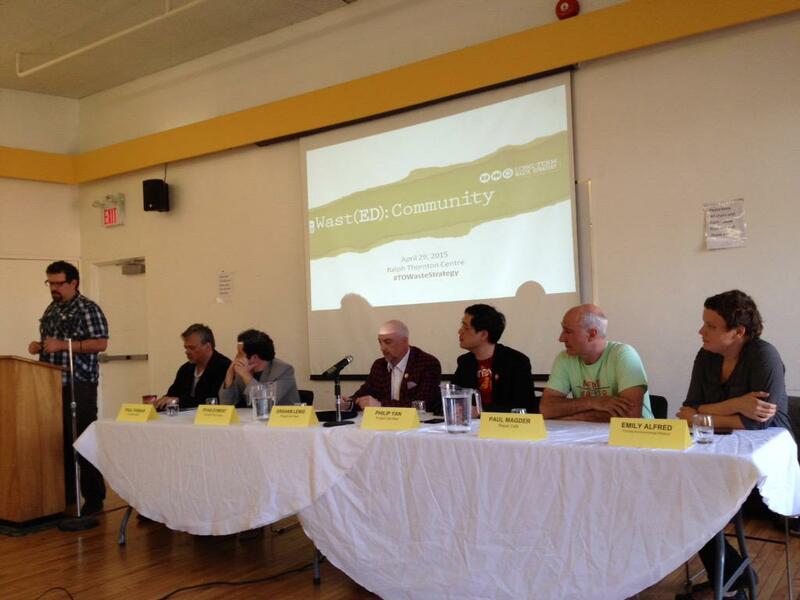 This event was the first in a series of Waste Education talks hosted by the City of Toronto. Attend the next talk on Clothing in the Waste(ED) series (May 27).